ALA President Loida Garcia-Febo at the Rally for Libraries, Seattle Public Library. The third floor of Seattle’s Central Library, with its soaring glass-and-metal-curtain wall, furnished a dramatic backdrop for President Loida Garcia-Febo’s “Rally for Libraries” at the American Library Association’s (ALA) Midwinter Meeting on Saturday morning, January 26. 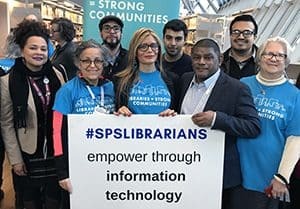 An estimated crowd of 150 vociferous library supporters, many holding signs supporting public and school libraries, gathered about the podium as Garcia-Febo fired up the crowd with a stirring call to action on behalf of libraries of all types. Several audience members held up signs with the hashtag #spslibrarians in support of libraries in Seattle Public Schools, under which were written such words as “equity warriors.” Another attendee raised a sign illustrating the impact of cuts to school libraries. ALA President Loida Garcia-Febo with supporters of libraries in Seattle Public Schools. Garcia-Febo, who was making a fourth stop on her Libraries = Strong Communities tour, touted the services offered by Seattle Public Library (SPL), including its lending Wi-Fi hotspots to homeless camps and working with community resource specialists to help homeless persons with everything from housing and mental health counseling to job training. 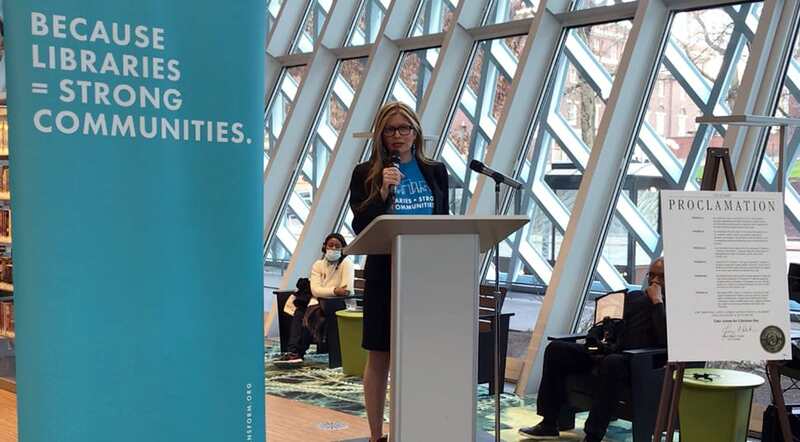 “The Seattle Public Library engages its community, working on the front lines to address issues affecting the city,” she said. Washington Library Association (WLA) President Rhonda Gould, executive director of the Walla Walla County (Wash.) Rural Library District, gave a special shout-out to those in attendance from Seattle public schools. 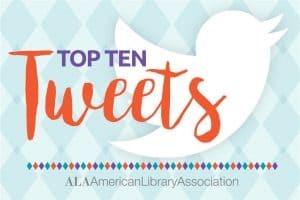 She said that in 2018 WLA was successful in bringing school libraries to the table throughout Washington State when Gov. Jay Inslee signed Senate Bill 6362, known locally as the “McCleary fix.” WLA lobbied to have an allocation added to school funding that was specifically earmarked for library materials in an amount equivalent to $20 per full-time student. “This will go a long way toward providing school library resources. 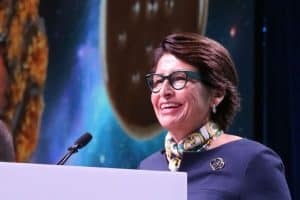 WLA will continue its work to educate the school districts on the importance of this legislation,” she said, noting as well that Inslee was a vocal supporter of net neutrality. Loida Garcia-Febo visits Seattle Public Library. Watch a video of the event on Facebook Live.